One of the best features that a website template could get is the parallax effect, which is the main reason why it’s possible to have moving backgrounds incorporated in your webpage. There is not a lot of themes out there that has this specific type of animation effect. Additionally, it also makes scrolling up and down look more smooth and fluid, helping your website with its visual aesthetics. 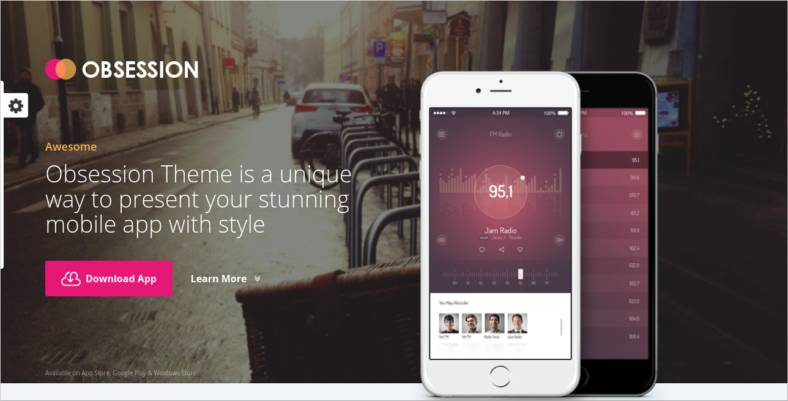 Although a parallax template could definitely be difficult, it is not impossible to get one. You just need to look for the right places and it is very fortunate that you found your way here. Why? Because we have 30 of these parallax free landing page templates on the list that we have prepared below. This will definitely help you get started, so go ahead and scroll down to check them out. Corporational is one of the best business templates that an individual could get. One of its features is its responsive design, making it capable of being viewed and accessed via multiple devices, like mobile phones, desktops, laptops, or tablets. It has integration with Google fonts as well, making it possible for you to change the theme’s typography and match it to the design you have in mind for your website. You won’t even have to worry about different types of browsers that your site visitors, or customers, would be using because the template has a cross-browser compatibility with most of the popular browsers like Firefox and Chrome. The theme also has Photoshop Document (PSD) files included in its package that you could use whenever you need to. 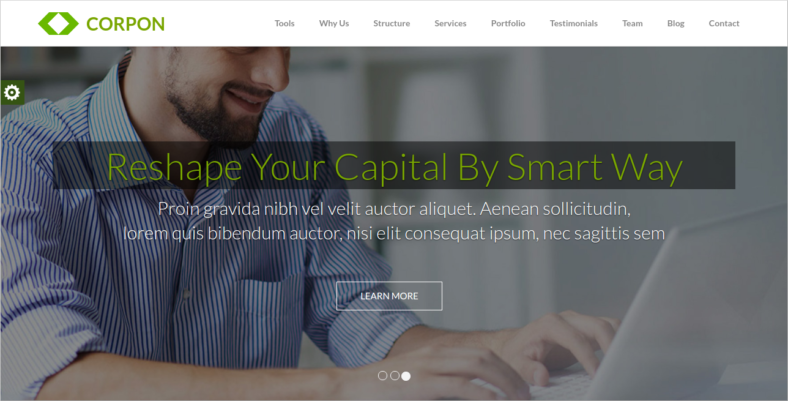 AppEx is one of the few HTML5 landing page templates that you will be able to stumble upon, during your search for valuable landing page themes. Aside from the parallax effect that has been integrated into its design, the template has an awesome pricing table, a modern design that has been polished, and CSS3 animation. Its design is also 100% responsive and it comes with Google Fonts for your typography needs. It has MailChimp integration, eight gradient texture backgrounds, and more than 1,000 font icons that you could utilize to enhance the overall quality of your site and attract more visitors to it. 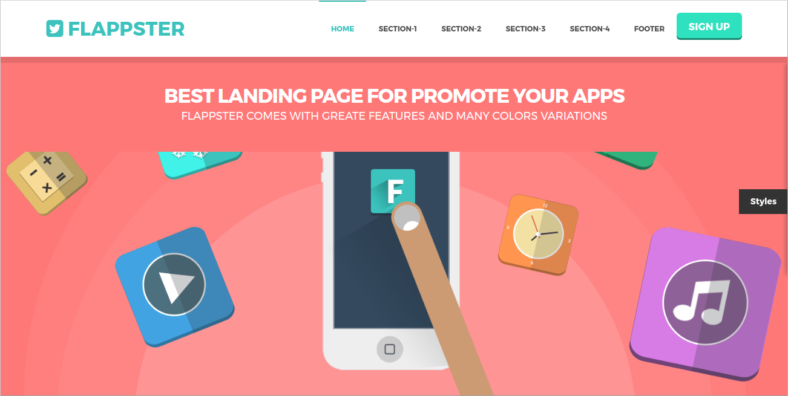 Flappster is a salient WordPress theme that runs using the Bootstrap 2.3.2 version, along with the latest version of Font Awesome Icons. It has PSD illustrations, parallax panels, and five color schemes that its users can have fun in choosing which of them would perfectly match the design they have in mind for the site. You won’t have to worry about your webpage being accessed on mobile or tablet devices because it has a scrolling plugin. It also uses Dribble-like graphics, illustration design, and styles as well, greatly enhancing the theme’s visual quality. 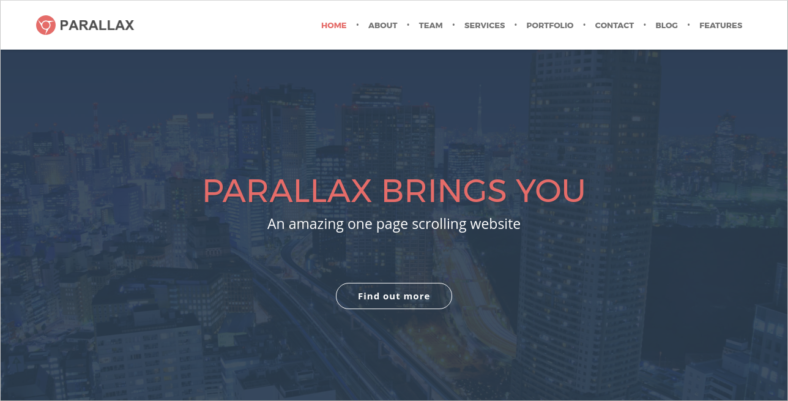 The aptly named Parallax, a parallax scrolling template, provides the necessary features for its users to create a wonderful website that would certainly make people visit it, not just once, but plenty of times. This theme is jam-packed with features such as Parallax Background Sections, Ken Burns Image Slider, eight custom Weebly Widgets and a YouTube Video Header. But that’s not all of the features that it has to offer because it has an additional 13 custom widgets, an interactive Widget generator, and a bunch of distinct Custom Slider Headers. This template is definitely something you should try for yourself. 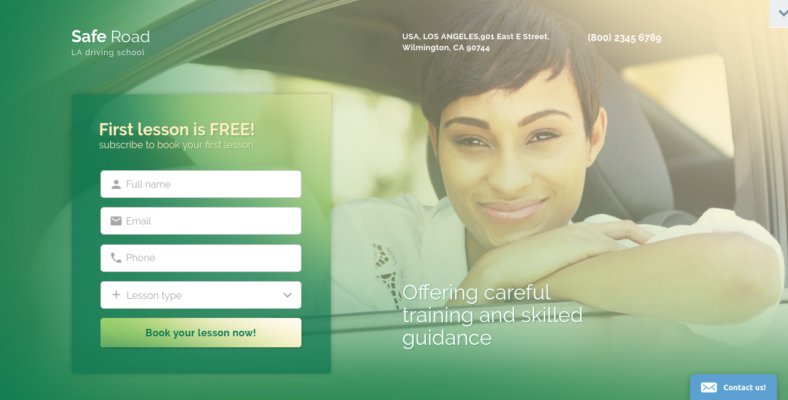 Safe Road is one of the many responsive landing page templates that has been made available to the market, all thanks to the developers and designers who made them. Aside from its parallax features, it has a bunch of different ones, too, like a countdown timer, various sliders, and retina-ready images. It has valid semantic coding as well, which means your site would have a better SEO rating and you get to have a quick loading speed for your webpage, too, which would make your customers, or site visitors, come back because they would have an overall amazing experience. The template’s documentation also covers every tiny detail, from the ins and outs of your website and theme to the functionality you will be employing. Aria is a clean and minimal landing page that was developed using the latest version of Uikit and Bootstrap. One of the main reasons why this theme is such a big hit is because of its user-friendly interface, making it easy-to-use and navigate. It has filterable portfolios, which makes organizing videos and images a superbly simplified task. It is also fully responsive and has a retina-ready design, making it capable of adjusting itself to fit into any size of the screen, on any device. You also get to use more than 400 Google fonts and over 1000 icons. 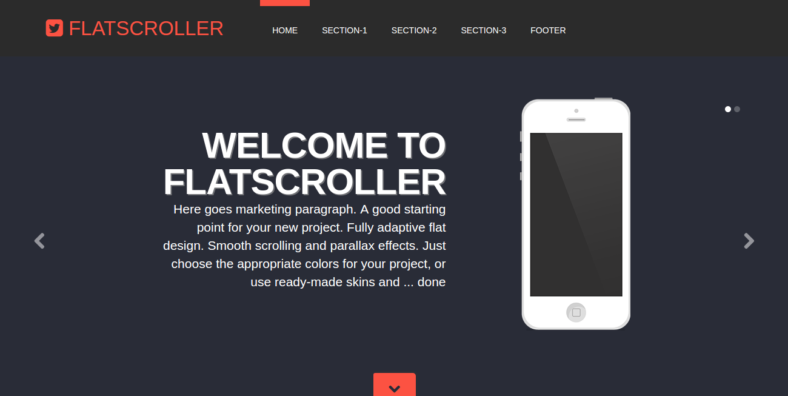 FlatScroller is a Bootstrap landing page template that has a one-page parallax effect, along with scrolling plugins for tablet and mobile devices. The header section has been equipped with a slider that adds to the template’s overall visual quality, providing your customers and visitors with an amazing website to view. The slogan panels also have call to action buttons, compelling your customers and visitors to make a decision, or take action. Its footer has a social section, too, giving you the opportunity to share content from the site, effectively increasing its reach to a wider and bigger number of individuals. 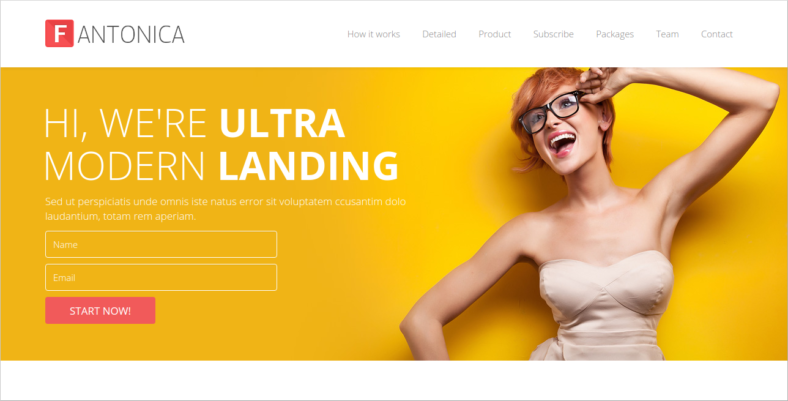 Corpon is one of the many amazing business landing page templates, which give you the opportunity to create amazingly attractive websites. This template has a modern design to it, which is perfect if you have a plan to make a portfolio, business, or corporate type of webpage. You can expect that this theme will be 100% responsive, which gives your site the advantage to be compatible and viewable on any device such as a mobile phone, desktop, laptop, or tablet. It uses parallax image effects as well, which enhances the quality of the featured images that you choose to incorporate into your site. 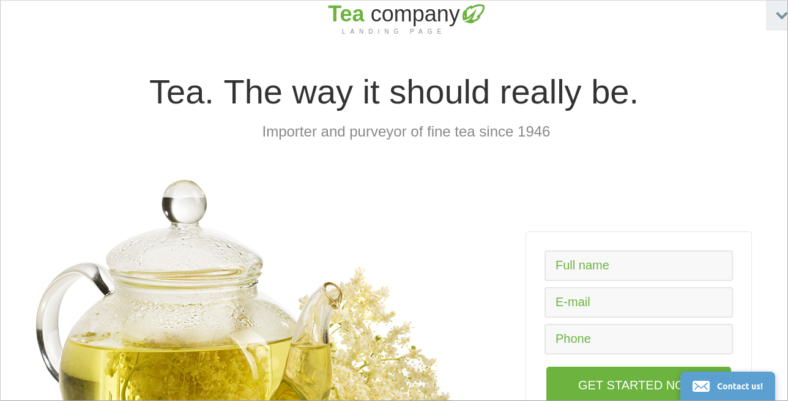 If you are looking for a tea shop template for your tea business and if you are also looking for one of the best one-page landing page themes that you could get your hands on, then you should definitely check Tea Company out. Not only does it sport a parallax effect to greatly improve the quality of your site’s visual aesthetics, it also has a Contact Form that site visitors and customers could use to get in touch with you. Font icons are also available for use, all of which can be adjusted to different sizes without having to sacrifice the quality of the image. Additional features are PSD files inclusion, Google fonts, cross-browser compatibility, and a newsletter subscription. 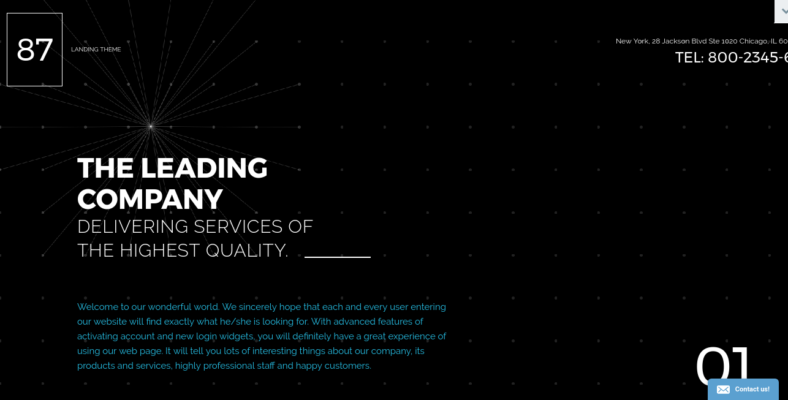 Fantonica is a creative landing page that has a clean design and various content sliders. This lets your website have an amazing amount of visual quality, making it look amazing and you can add numerous contents to it to lure people further in. It has a parallax effect as well, which further enhances the visual aesthetic of your site and makes its movements more fluid. You get to have free Google fonts and icon fonts provided by the Awesome brand, along with the OnScroll Animate. It has cross-browser compatibility with Firefox, Chrome, and Safari as well, making you worry less about the browser your visitors might use. 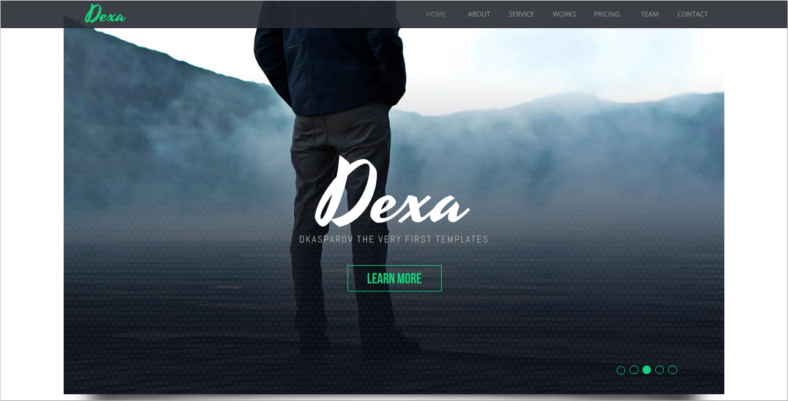 Dexa is one of the many advertising agencies templates that you definitely should consider getting. Not only because it has a parallax scrolling integrated into its design, but it’s also due to the many helpful features that it has. Take its fullscreen slider, for example, which is very helpful if you’re aiming to add a slider that’s smooth and fluid to the fullscreen design of your webpage. It has multiple types of layouts as well, giving you a greater opportunity to customize the template until it fits your ideal. It also has widgets for Google Maps and YouTube, allowing you to easily share YouTube videos. 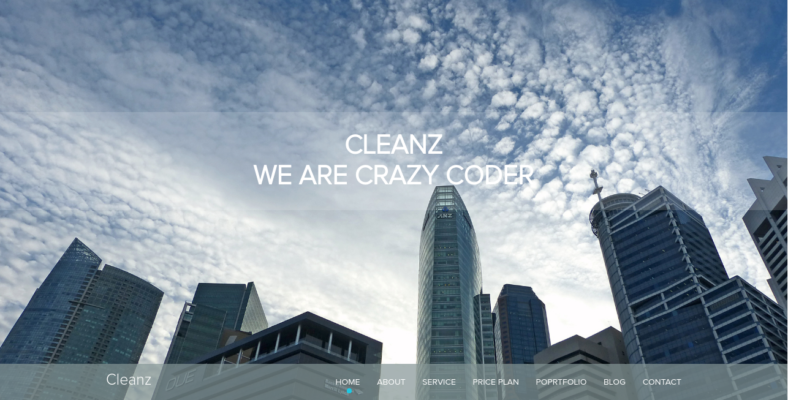 If you are looking for parallax responsive website templates, then Cleanz is definitely something you should try. Aside from being fully responsive, it also sports a modern vibe and look to it, making the aesthetic quality of your site appear professional and sleek. It has an assortment of features like a 404 page, the one that would pop up if you’re unable to find a page on the Internet, which adds to the overall experience of customers. You might want to tweak the template’s typography and that’s why the developers added some Web Friendly Fonts that you could choose from. 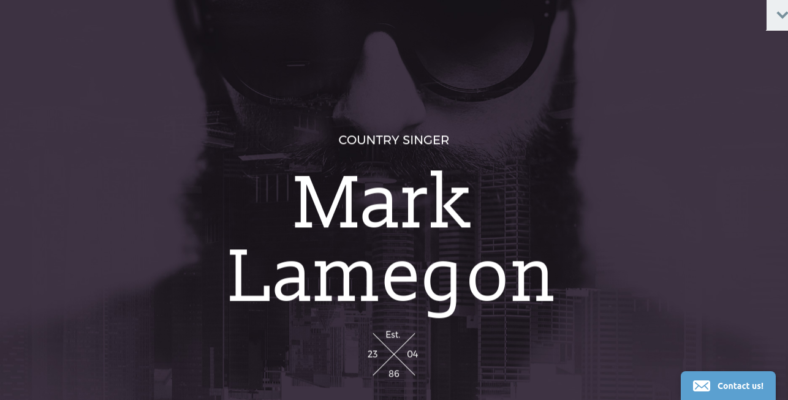 The Mark Lamegon landing page theme is a singer website template that various musicians could use. They would be able to advertise and market the songs they have made, give people the chance to listen to them and announce news of events like gigs, album launchings, or concerts. It can be viewed and accessed using different types of browsers, thanks to its cross-browser compatibility feature. It is also pretty responsive, which has been purposefully made by its designers this way since most people are usually using their smartphones to access the Internet. The Newsletter template subscription option is also available, making it possible for your customers to follow your website and receive any update, or content, that you will be putting on it. 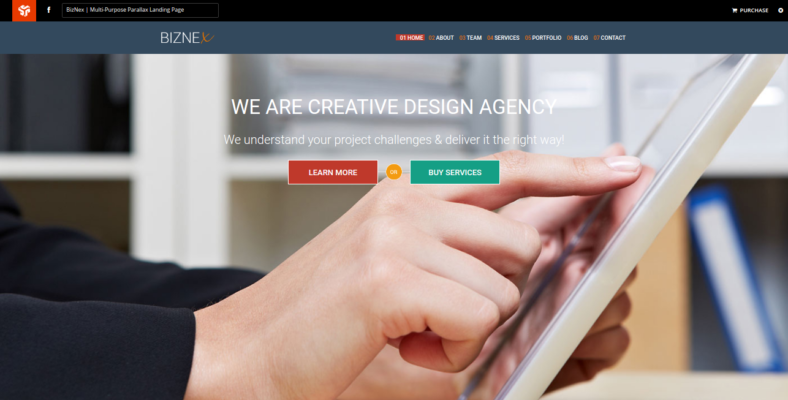 BizNex is one of the few premium landing page templates that offer excellent features for their users. Its animation is taken care of by the HTML5 and CSS3 animation functions that have been integrated into the template’s design. Different types of browsers would also be the least of your concerns because this theme has a cross-browser compatibility and can be viewed on popular browsers like Chrome, Internet Explorer, and Firefox. You also have an option for using its parallax effect or turning it off, whichever you would prefer. It has Web Friendly Fonts, too, giving you the chance to enhance and personalize the template’s typography. 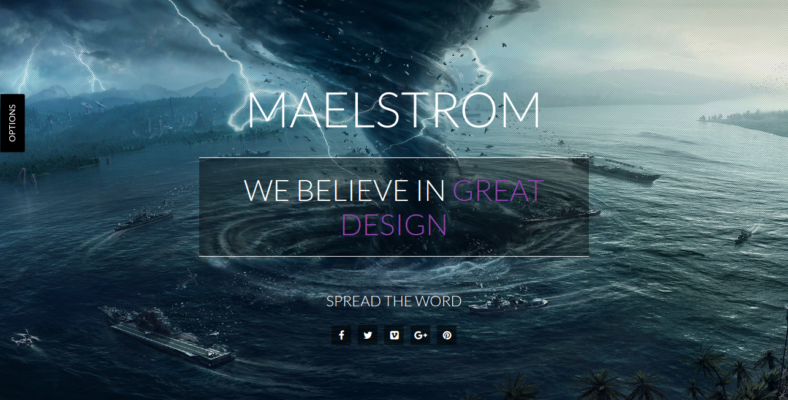 Maelstrom is one of the 12 best professional landing page templates that one can find out there in the market. It is perfect for websites like non-profit ones, creative portfolios, and any type of business in general. 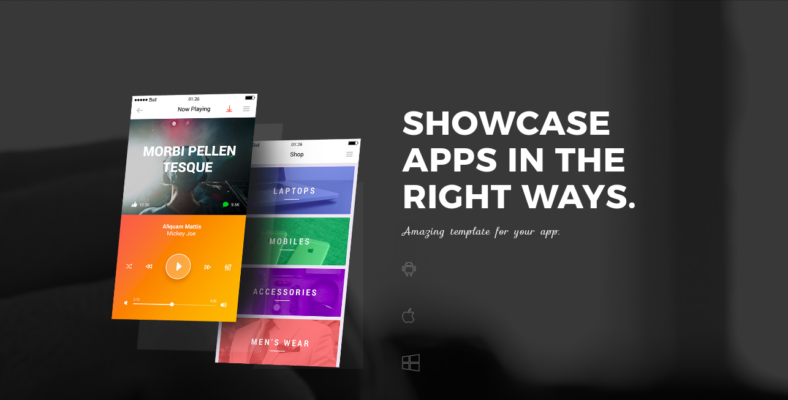 It has parallax effects, filterable portfolios that utilize an isotope plugin, and motion backgrounds. However, it has more than just that up its sleeves because it also features 10 preset color themes, five homepage variations, more than 600 Font Awesome Icons, and a layout that is 100% responsive to any type of device, whether it is a laptop, desktop, tablet, or mobile phone. Mady is a responsive landing page that was mainly built for apps. However, the web developers tweaked it, so it would be available to be used for websites, which now makes it a brilliant theme for your single-page website. Some of its features include parallax sections, which is very useful for improving your webpage’s visual quality. Icons are also very important for websites and that is why the web designers of Mady included more than 400 Font Awesome icons that its users could choose from. It has CSS3 Animations, too, which is one of the best animation tools when it comes to web designing or webpage making. 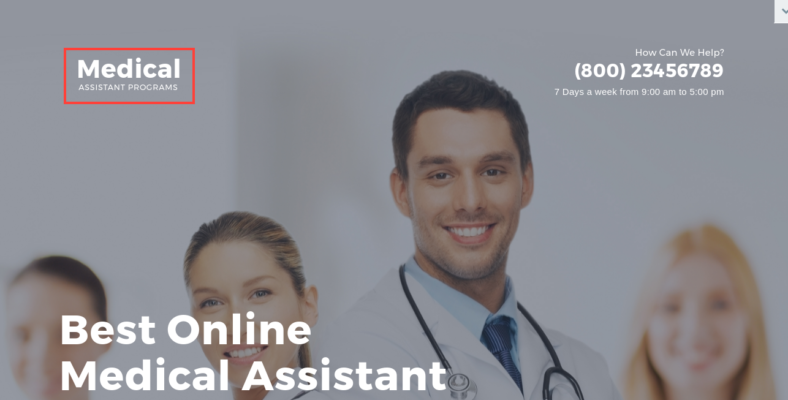 Medical Assistant Programs is a landing page template that allows its users to showcase medical services to various people via their website. The theme has a lot of useful functions like valid Semantic coding, which makes your webpage load faster, Contact form and a responsive design, which lets your customers and site visitors use any type of device to access and view your website. Whether they’re using a laptop, mobile phone, desktop or tablet, it won’t be a problem for this amazing template. Additional features include the Font icons provided by the designer and a plethora of Google Web Fonts, which you could use to personalize the template’s typography and change it so you would be able to personalize the site down to the tiniest details. 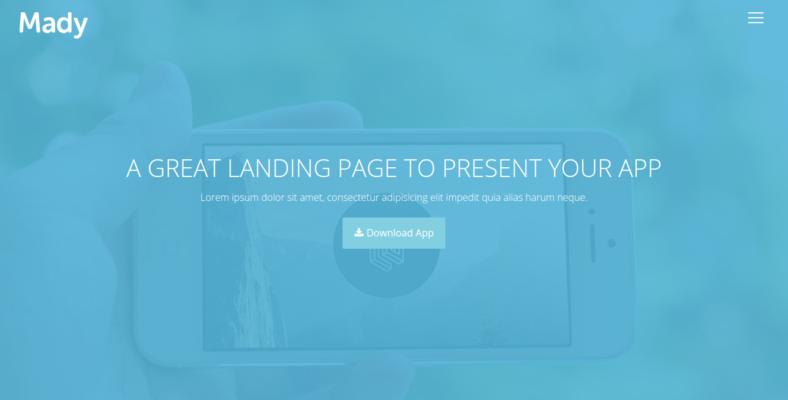 Are you looking for some corporate landing page templates? 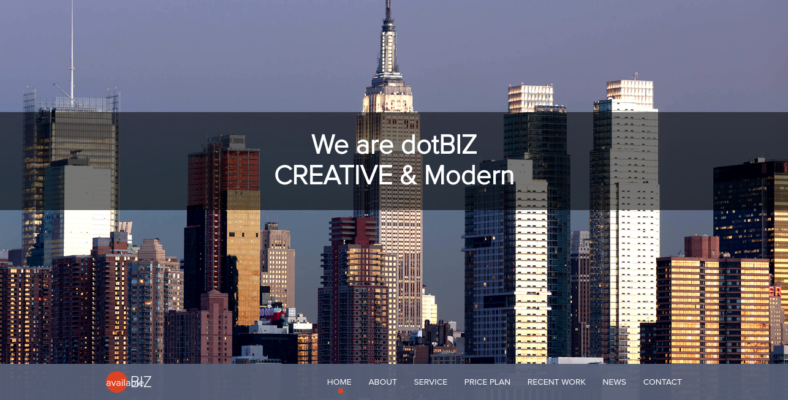 If so, then dotBIZ might be the one you are looking for. With its many features, including parallax effects, you will definitely find yourself satisfied with this template’s functionality. It is fully documented to help its users understand how the theme works. 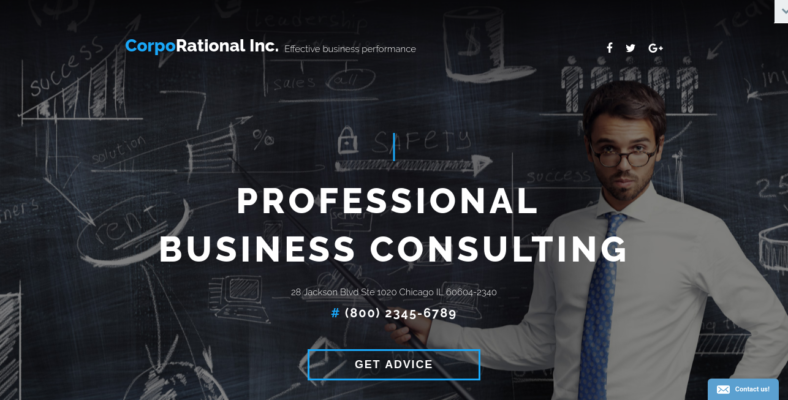 It has a 960 grid-based website layout, which is perfect to help you streamline the workflow in your company or business. This template is also based on Bootstrap, one of the most powerful frameworks for templates, which means its performance is something that will definitely impress you and your customers. 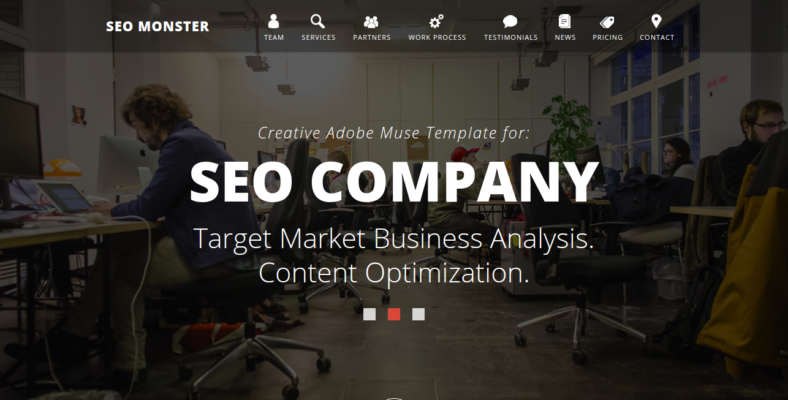 SEO Monster is a creative template for landing pages due to the many amazing features that it has for those who would like to utilize it. 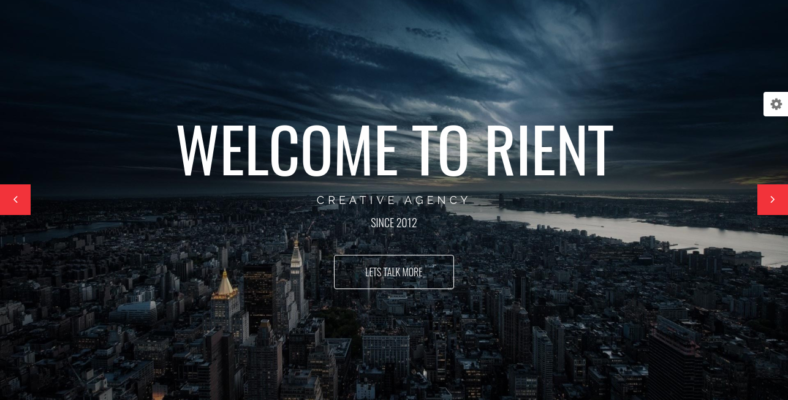 This is even considered to be the most appropriate landing page theme for small businesses, startup companies, and various agencies. Some of its features include a fullscreen slider, which is perfect for enhancing your site’s aesthetic quality. A parallax background is also available for those who would like to apply this to their website and, in turn, attract more customers and site visitors. The theme also has a built-in Contact PHP Form, which your customers could use to contact you, whenever they need to. FlyCreative is a Bootstrap-based, one-page HTML template, which is also one of the many new blog themes in the market. It’s only natural that it would have HTML5 and CSS3 animations as some of its features because it is an HTML theme after all. However, it has so much more useful stuff to offer, like the various shortcodes that would help with your site’s functionality and overall performance. To further aid the visual aesthetics of your site, the template has also been embedded with parallax, giving your site a more fluid and smooth look, making it more attractive for anyone. 87 is a highly precise landing page, which is found to be one of the perfect financial website templates that consumers could get their hands on. Its design is fully responsive, making it compatible with many devices such as mobile phones, tablets, and desktops. Animation methods have also been incorporated into its design, specifically Canvas Animation, which has been meant to improve visual quality. It has Sliced PSD, Google Web Fonts, and Favicon, all of which enhance the overall quality of the site you plan on making. In case your customers would like to contact you, it wouldn’t be hard for them to do that as well, thanks to the Contact Form the theme provides. 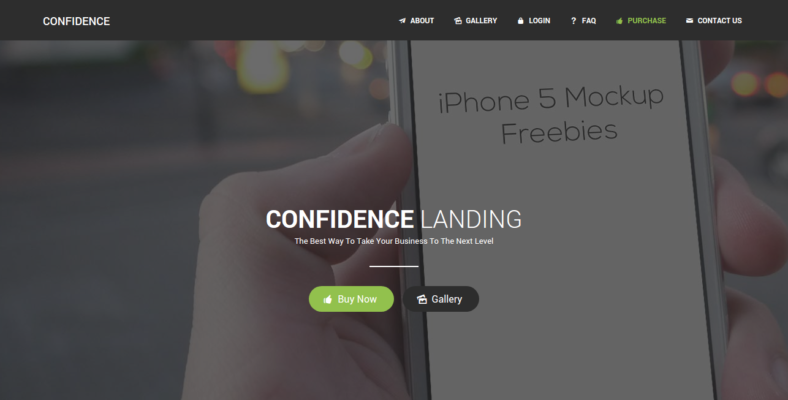 Confidence is a landing page template that can be used for different purposes, which means it can be used for art, business, medicine, and much more. It is also a retina-ready template, which means it is able to adjust itself to fit any size of a screen, without sacrificing the site’s visual quality. Since one of its features is being retina-ready, it is only natural that it is accompanied by a responsive layout, letting your site be accessible and viewable on various devices. A parallax background is also one of the many features it has, along with HTML5 and CSS3 animations. 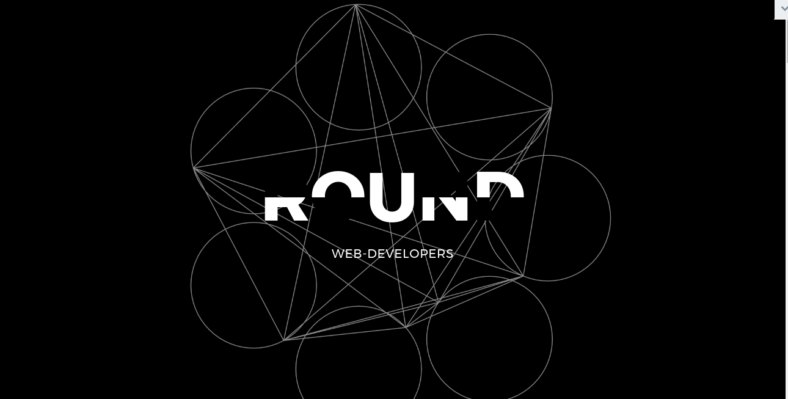 Round is a web developer template, which means it was created specifically for web designers to help make the process of webpage creation easier and simpler. This would mean that web designing would take less time and help web developers enhance their efficiency. It uses HTML plus JS, short for Jave Script, along with parallax effects, for maximum results. The template has a very strong line up of coding such as Sass, HTML5 Semantic Code, jQuery template, Valid coding, and CSS3. It has integration with Google Maps, too. 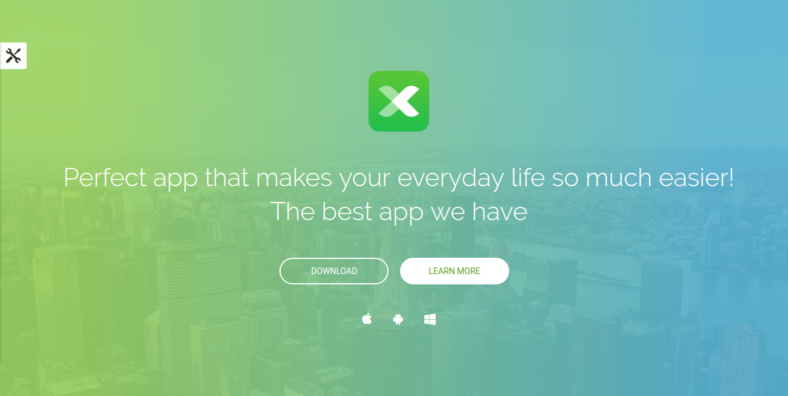 If you are looking an app landing page template, then you should check Obsession out. It has 15 different color skins, all of which you can use at any given time, letting you personalize the landing page to suit the colors you have in mind. The template has a subscription form as well, and it uses MailChimp for it, which is one of the best forms for the task. Additional features include a responsive portfolio section, brand new Icon boxes, and an accordion section. You won’t have to worry about its level of performance too because this one runs on the Bootstrap 3.3.1, making one of the most efficient apps landing page. 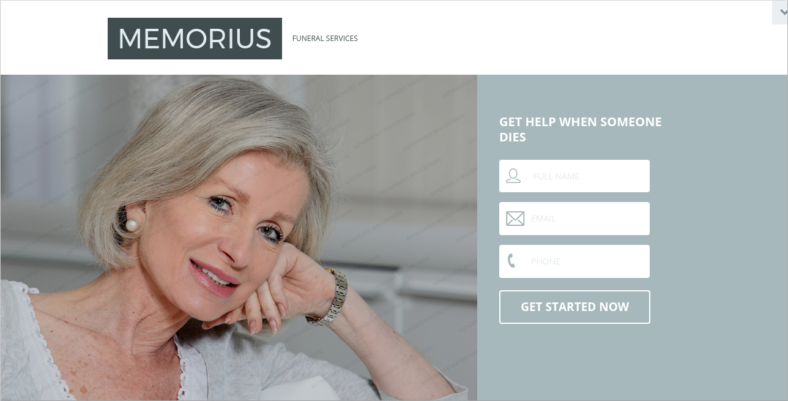 Memorius is a funeral service landing page template that is fully responsive with parallax effects and a bunch of other features. Sliced PSD has been integrated into the template’s design, which makes it one of the PSD landing page templates that are available on the market. It has a drop-down menu as well, which customers could expand or collapse at any given time. Aside from having a Contact Form, this theme also has a Newsletter Subscription option for site visitors and customers, which would give you the convenience of sending your patrons important updates via email. 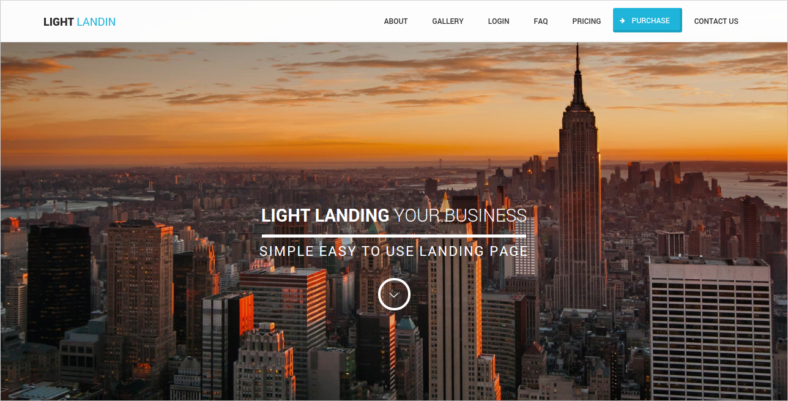 Light Landing is a multipurpose parallax landing page that can essentially be used for any kind of website you have in mind. It could become a school template, or it could be used for creative agencies and product shows. One of its features is the parallax background that is embedded in it, which helps with the overall graphics quality of the site. To complement the parallax background, it has HTML5 and CSS3 to handle the animation aspects of the site you have in mind. There is also a need to showcase your product or service properly, which is why the template’s Product Slideshow is very important because it takes care of that specific task. 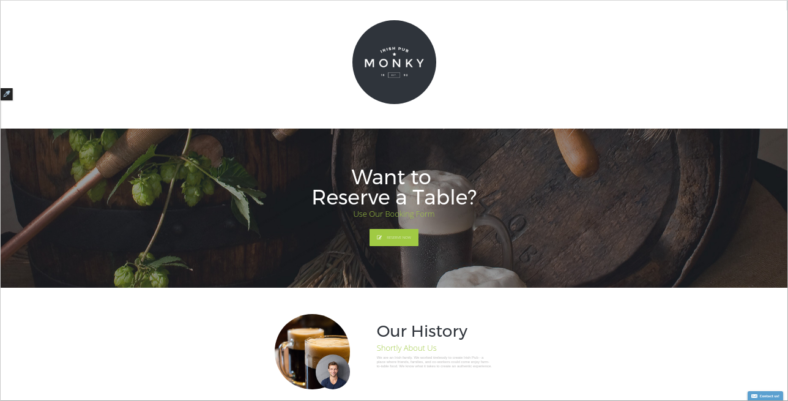 Monky is a responsive pub landing page template that is useful for bars, pubs, and restaurants. Since it is still under the category of food and beverages, it is still considered as one of the many restaurant templates out there. This theme’s coding includes the 1170 Grid System, on top of the common ones like Semantic Code and JQuery. You won’t have to worry about different browser types with this one because its cross-browser compatibility will take care of that, giving your site the opportunity to be viewed and accessed by a large number of people since it is not limited by browser issues. Pets are considered as family members in many households, which is why it is important for people to take care of their welfare as well. 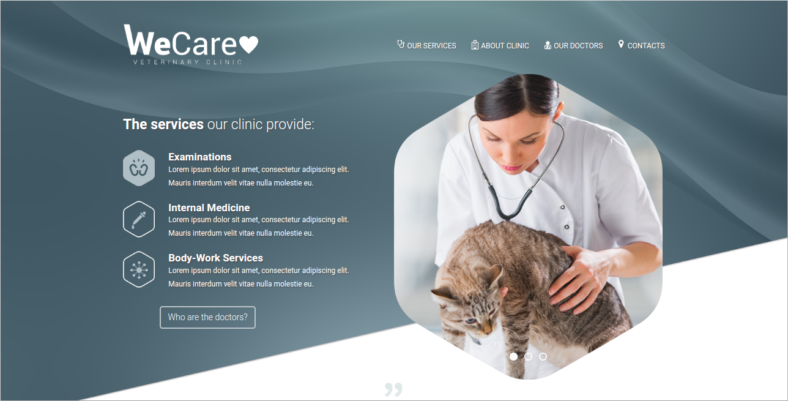 If you have plans on creating a webpage for your veterinary business or for a client, then Wecare will definitely be of big help to you. This animal and pets HTML5 theme is jam-packed with features, one of which is the famous parallax scrolling effect, which makes scrolling up and down appear more fluid. It has customized sliders and a fully responsive design, both of which is very important for your webpage’s visual quality. 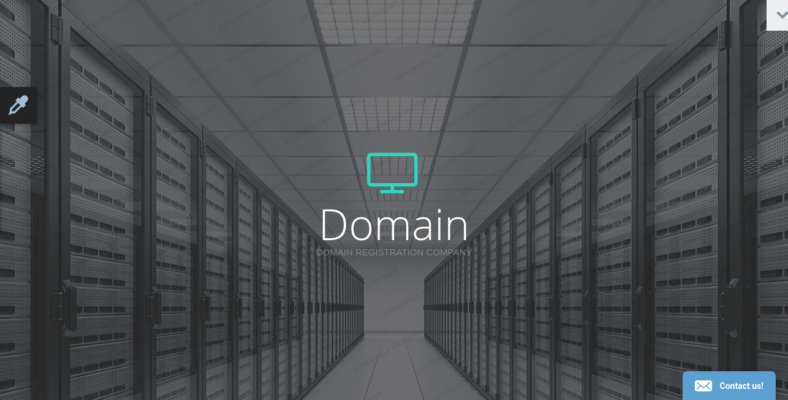 Domain is one of the best templates out there that caters to the needs of companies or businesses. You could pair it up with a PHP, short for Personal Home Page, registration template, to further augment the capability of your web server. Aside from having the 1170 Grid System, which is a lot of help for situations like this, online chat is available, too, which gives you the opportunity to get real-time assistance, in case you encounter some technical issues. Of course, the Parallax effect is there, but one of the interesting things about this template is its Theme Color Switcher, letting you change the theme’s color easily. Rient is a multipurpose website template that is used for landing pages. It has a plethora of features that will certainly amaze anyone who decides to use it and enjoy the many advantages it has to offer. For one, it has full layered PSDs that you can use at any given time to further improve the overall quality of your site. You also get to choose from 12 unique variations, all of which have been beautifully laid out for your convenience. Isotope filters are at your disposal as well, allowing you to enhance the quality of the images that you’re going to use for your site. So those were some of the parallax landing pages you can use for a product landing page, or to serve as a front page, that we were able to gather. Don’t forget to try them out and check out other ones that may not have been mentioned here too. Also, don’t forget to check the features when it comes to choosing templates. The features are the most important aspects of templates because these are the main tools that you will be using during the whole process of creating that ideal website you have in mind. Without the necessary features, you won’t be able to achieve the desired result.